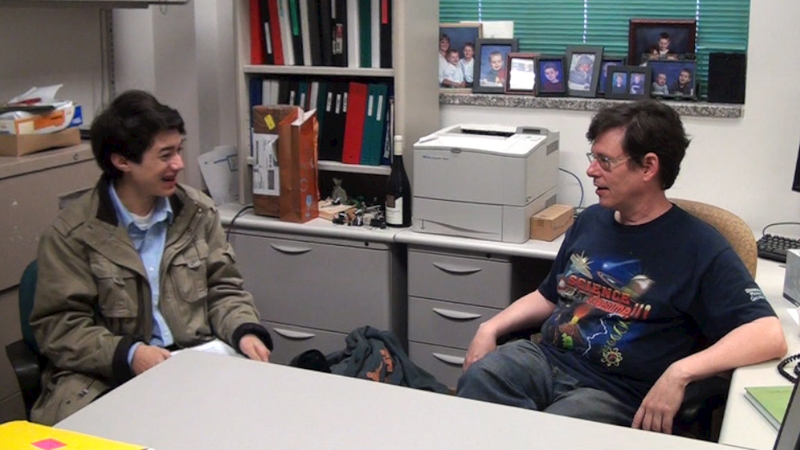 Commander Ben and Dr. Andrew Ellington talk about cellular biology and more fun stuff at Dr. Ellington’s UT Austin lab office. I had the honor of interviewing Dr. Andrew Ellington to talk about his Diagnosing Ourselves: Take Two Assays and Don’t Call me in the Morning lecture. His presentation is part of the great Hot Science – Cool Talks lecture series that’s hosted by the Environmental Science Institute at the University of Texas at Austin. Dr. Ellington is a Professor of Biochemistry with the Institute for Cellular and Molecular Biology at UT Austin, and his talk focused on his work in developing low-cost, personalized diagnostics and the creation of virtual clinical trials through social networks to improve healthcare on a global scale. His presentation completed the great series of lectures for the Spring 2013 semester, and it was a great one! I interviewed Dr. Ellington in his office at his laboratory on the UT Austin campus. His lab was amazing. It was huge with lots of activity. When Dr. Ellington and I sat down to talk, he turned the tables on me! 😉 He started asking me the questions!! I was so nervous, but I did my best to recall my science facts. It was actually a lot of fun talking with him and Dr. Ellington is an amazing teacher! But Dr. Ellington likes to think of himself as more of a mentor than a teacher, since he believes that it is the students who, in a way, teach themselves to absorb the information that they are exposed to by a mentor–which is so true. I hope you’ll enjoy my series of video interviews with Dr. Ellington. He shares lots of great information about evolutionary techniques to engineer biopolymers and cells. It is quite an education…like having the privilege of being in one of his classes at UT! Is it as simple as DNA makes RNA makes protein? Dr. Ellington describes cellular and molecular biology, including how the process of evolution helps make beneficial mutations more dominant. Unfortunately, mistakes can and do occur during cellular replication. Dr. Ellington addresses other bad mutations that can also occur through environmental concerns, such as ionizing radiation, and mutagens, such as cigarettes. Dr. Ellington also discusses sequenced versus non-sequenced polymers and the possibility of life originating from matrixes, a theory advanced by the Seven Clues to the Origin of Life book. Ever wonder how to use evolutionary techniques to engineer biopolymers? Is it okay to let cellular mutations duke it out? Are 99% of all mutations bad? Dr. Andrew Ellington talks about how there are more bad mutations than good, but many mutations are neutral, allowing bacteria to drift along until they find a good place, which may help them over time get to be the most awesomeness bacteria ever. Dr. Andrew Ellington talks about the types of low cost diagnostic tests that are available now and those that might be available in the future, including new blood sugar monitors with needles so small that users can’t even feel them. His goal is to make more tests available at lower cost to help them become more widely used and to create fun tests that can help people learn more about themselves. (4) Is it possible to create a Star Trek Tricorder? Dr. McCoy had a lot of cool diagnostic devices. Dr. Andrew Ellington explains some of the obstacles to creating a Star Trek-like medical Tricoder with our current technology, and he gives a glimpse of how sensors the size of molecules could be used in the future. You’ll also learn about Dr. Ellington’s favorite computer games. 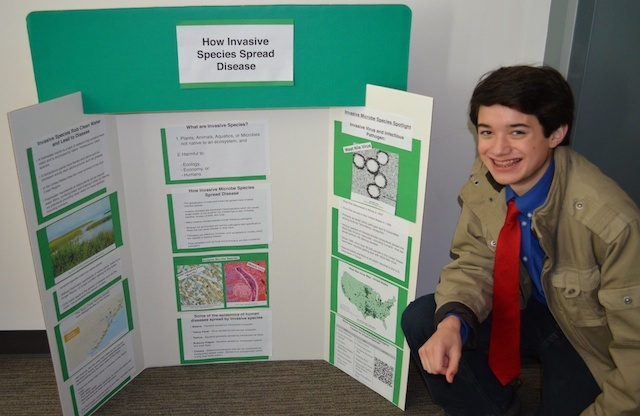 For the prelecture fair, I prepared a poster board explaining how invasive species can spread disease. 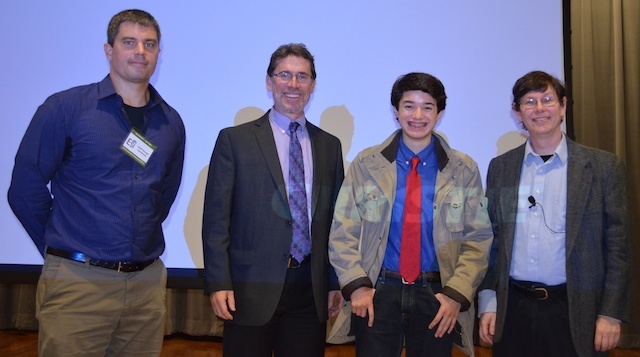 Thanks Dr. Jay Banner, Director, and Mr. Geoffrey Hensgen, Outreach Coordinator, for the Environmental Science Institute at the University of Texas for the great lectures and chance to talk with great and leading scientists.